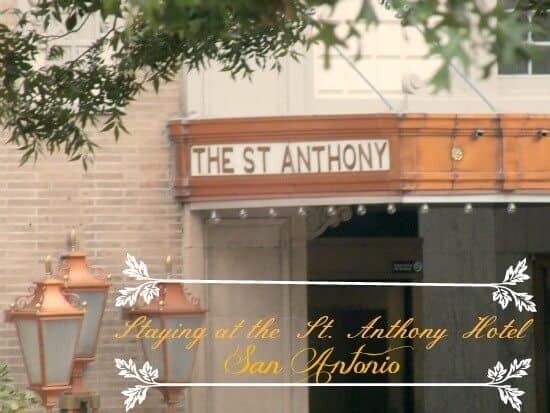 The historic St. Anthony Hotel in San Antonio is a fabulous retreat for anyone who love to be pampered and surrounded by glorious Victorian charm. 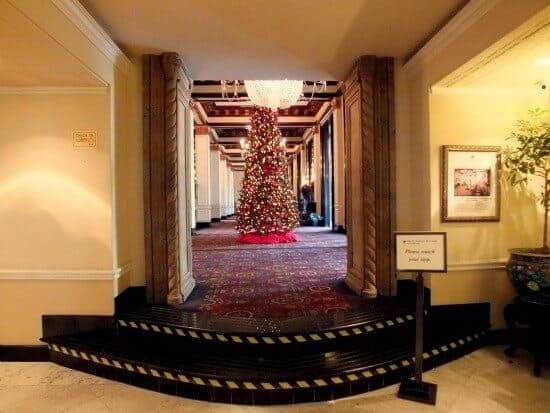 Just after Thanksgiving my husband and I hopped in the car and headed down to the St. Anthony Hotel in San Antonio for a well deserved couple of days of togetherness before the chaos that is December began. The end of October ushers in about eight weeks of craziness for our family. Grandson’s birthday, Marc’s birthday, Ethan’s birthday (both on the 11/10), best friends’ anniversary, our anniversary, best friend’s birthday (wife), best friend’s birthday (husband), Thanksgiving, Gingerbread House Party, Sean’s birthday, step daughter Christine’s birthday, Christmas, New Years. Figure it out – we have something going almost every week. So, when we got a chance to stay two nights at the historic hotel we jumped at it… and drove to it, even though I was armpit deep in deadlines. I wrote articles all the way down and wrote articles all the way back. I found out that I can write approximately eight articles in the time it takes to get from Dallas to San Antonio in moderate traffic. To say that we had a blast is a sad, sad understatement. We were there for the holiday lights and it was just beautiful. The weather was warm enough to make it pleasant to walk around San Antonio and cool enough to keep me from sweating like a draft horse in the process. The St. Anthony Hotel was built one year before my house, in 1909. While it has (obviously) been restored and updated, the work has been done with an eye toward authenticity. 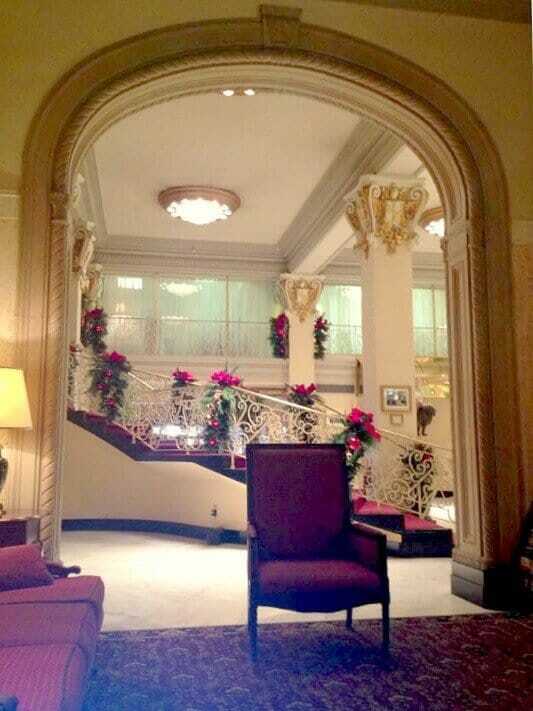 The hotel looks much as I imagine it would have looked in Edwardian times. Many famous people have stayed here including John Wayne and Princess Grace of Monaco. When you walk through the lobby you can certainly understand why. I don’t think he recreated the scene from the movie but the car always seemed to be ready for us – right next to the valet’s office. You go from the garage into a small-ish vestibule and up some steps into the lobby. It was at that moment that I knew that this was the place for me. There was a huge Christmas tree in the center. The furniture was in the Edwardian style and the chandeliers were either electrified originals or really good copies. Best of all? Lots of red. 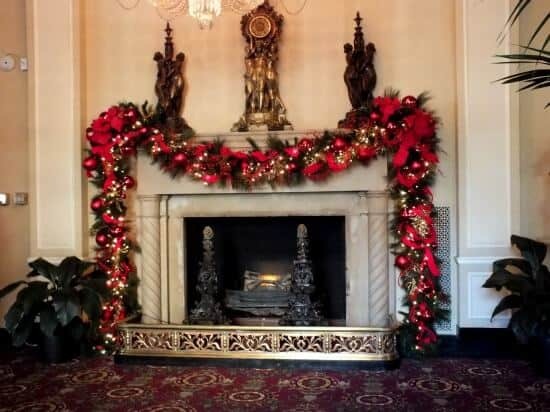 Everything was gorgeous from the original antique paintings to the marble fireplace. There are little seating areas here and there and a bar with a television over it right in that main hallway. I never saw anyone manning the bar so I guess it is just for weekends or special events. Windows overlooking the street and the park line the outside wall of the hotel while elaborate woodwork and doorways to the various special events rooms line the other side of the hall. The rooms are large – or at least ours was. It was what they call the Parkview King (sometimes the elegant view king?) There was a desk with a chair, a four poster bed, and a dresser, along with a coffee pot and the other things you would expect to find. The bathrooms have black marble floors, large showers, and nice sized bathtubs. I was glad that I had brought one of my LUSH bath fizzies! The hotel was quiet but we checked in on a Sunday night and out on Tuesday afternoon – so it may have been just one of those weekday things. The WiFi in our room was not working which meant that I had to take my laptop down into the lobby when I wanted to take care of some work. The lobby is so quiet, so beautiful, and has so many little nooks and seating areas that this was not bad at all – and I think I almost would choose to work that way the next time I visit whether or not WiFi is available. Look at the image above – do you blame me? This was my favorite spot to work. 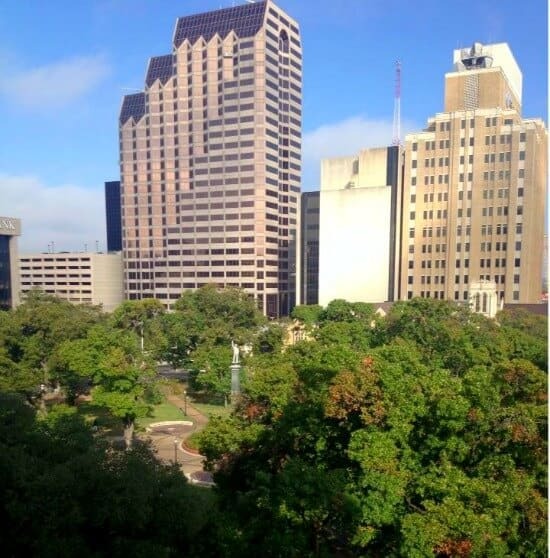 We were on the 7th floor facing the park and the view was beautiful. When you reserve a room (and I say when because I know you will!) do try to get one of the upper floors facing the park. It was just breathtaking. At night the Christmas lights were everywhere and from this vantage point it was magic. I was sad to leave. I know, it ‘s silly. I loved getting home to be with my family but the weekend was just what we needed at the time. I think within three days of being back home and reality hitting – well we were ready to go back and be pampered a bit. I’d highly recommend the St Anthony if you love Victoriana, romance, and beauty. If you are more into convenient WiFi, spa tubs, and technology? Not so much. It is right in the center of everything you are going to want to do in San Antonio – you won’t miss a thing. And anything you do happen to miss? You won’t care! There are some rumors that the hotel is haunted. I didn’t see any ghosts, nor did I experience any weird activity – but then I live in a 100 year old house, myself. 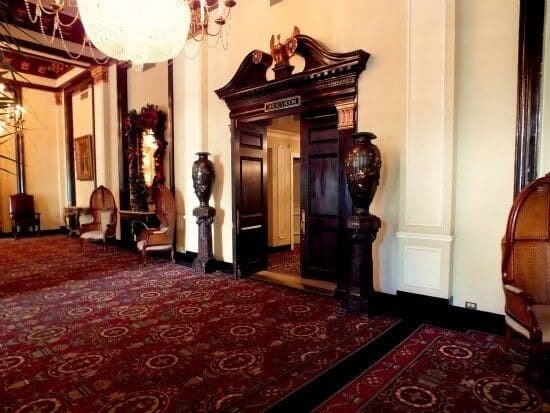 If you want to read more about those possibilities there is an interesting post,Ghost Hunting at the St. Anthony Hotel. If you’re ready to create a romantic, pampering, luxurious weekend take a look around the St. Anthony website. Whether or not you are entertained by ghosts is another story. In case you were wondering? This was not a sponsored review. They don’t even know I exist. 🙂 All unbiased opinions, folks. 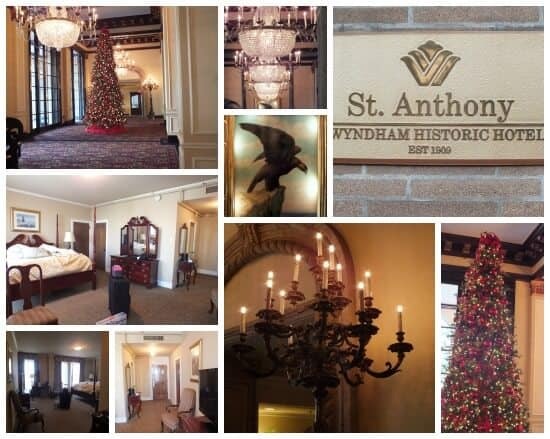 We had an excellent stay at the St. Anthony. From our arrival to departure the staff was extremely attentive and courteous. 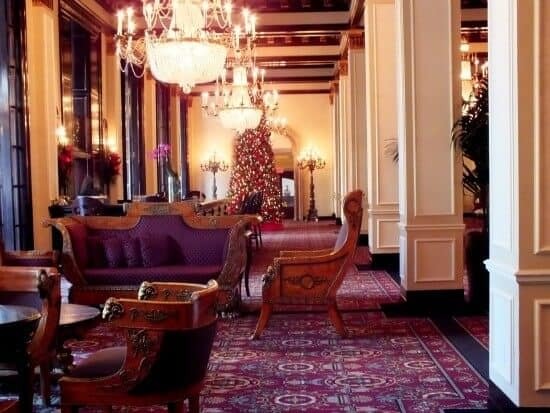 The hotel is opulent and has a classic style. Special thanks to Matt and Jorge for their help and friendliness!